Visit the unique regions of Westeros and collect their house seals on your map to earn an exclusive pin and gift certificate! Pick up a map at your local Coliseum of Comics location starting on April 6th (while supplies last). You’ll get your first stamp when you pick up the map. 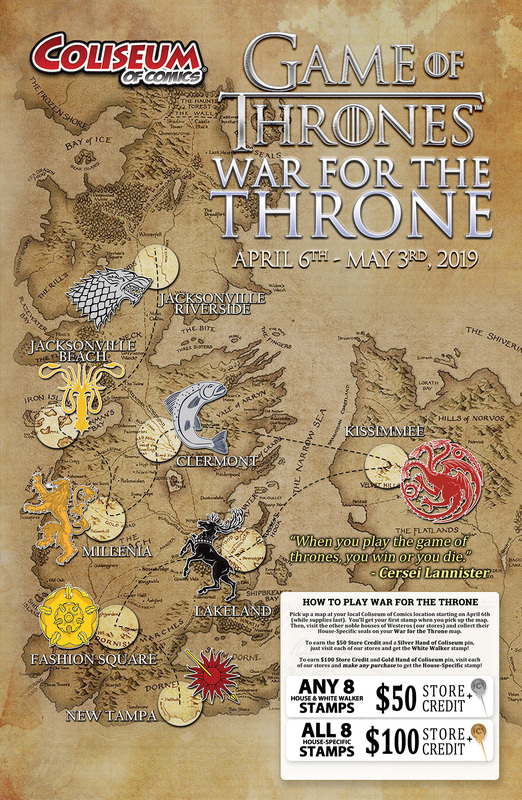 Then, visit the other noble houses of Westeros (our stores) and collect their House-Specific seals on your War for the Throne map. just visit each of our stores and get the White Walker stamp! of our stores and make any purchase (minimum $1) to get the House-Specific stamp! You may only complete ONE MAP per person and earn ONE PRIZE listed above. If you’ve collected all eight House-Specific stamps, you earn a $100 Store Credit certificate and a exclusive antiqued gold Hand of Coliseum pin. However, if you visit all eight locations and have any White Walker stamps, you will instead receive a $50 Store Credit certificate and an exclusive antiqued silver Hand of Coliseum pin. You also get a FREE STAMP at each store you visit with a map! 1. No purchase necessary. Limit One entry per person. Must be 16 years or older to participate. Valid id is required upon redemption. 2. Participating entrants must be present to receive stamps at each location. No replacements will be given for lost or missing stamps or maps. Maps are limited to a specific print run and are available on a first-come, first-served basis at all stores. Person must be present to pick up a map. 3. At each participating location entrants may receive one “White Walker” stamp for the given location with no requirements. With any purchase of $1 or more, entrants may receive a “House specific” stamp instead. For each location at which an entrant receives a stamp, either “White Walker” or “House specific”, the entrant may also receive one stamp on a qualifying Coliseum of Comics Stamp Card. Credit and debit cards require a $5 minimum purchase. 4. Upon receiving one stamp, either “White Walker” or “House specific” at each location, for a total of eight location stamps and a completed map, maps may be redeemed as follows: Eight “House specific” stamps will qualify for $100 store credit at any Coliseum of Comics location. Seven or fewer “House specific” stamps and any combination of “White Walker” stamps on all eight house locations will qualify for $50 store credit at participating Coliseum of Comics Locations. Store credit is not combinable with any other sale, special, or deal and is subject to all other standard Coliseum of Comics store credit restrictions. 5. Qualifying completed maps will also be redeemable for Coliseum of Comics stylized pins. Entrants who qualify for the $100 store credit will receive one Hand of the Coliseum gold pin. Entrants who qualify for the $50 store credit will receive one Hand of the Coliseum silver pin. Only one pin may be received per entrant. No substitutions or exchanges are permitted. Pins are limited and will be available in order of map redemption. If the print run of available pins is exceeded no substitutions will be offered. 6. Event begins April 6th 2019 at 10 am EST and ends May 3 2019 at 7 pm EST (or when the store closes). Completed maps may be redeemed beginning April 6th 2019 at 10 am EST and must be redeemed by May 31 2019 at 7 pm EST. After this deadline all unused credit and all unredeemed maps become VOID and no longer qualify for redemption. If you redeem it at 10:00 am EST on April 6th, we will interrogate you for improper use of time travel. 7. Coliseum of Comics reserves the right to modify, add, or alter these rules at any time before, during, or after the promotion. 8. Visit individual store pages for hours as they vary. Jacksonville Beach is closed on Mondays. THIS EVENT IS NOT AFFILIATED WITH GEORGE R.R. MARTIN NOR HBO, INC. The A Song of Fire and Ice setting is Copyright George R.R. Martin. Game of Thrones is TM Home Box Office, Inc.